I have been a fan of Charlie’s books since I was introduced to them earlier this year. As soon as he releases another book, I eagerly get a copy as soon as possible and do nothing else but read it for the rest of the day. 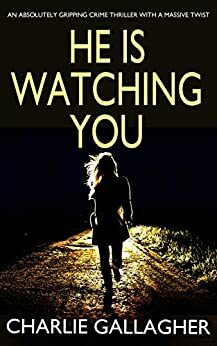 I very (im)patiently wait for him to release another book and for the time being the wait is over because ‘He Is Watching You’ was released on 14th November 2018. I absolutely loved reading this introduction to a new series but more about that in a bit. ‘He Is Watching You’ introduces us to the new detective pairing of Detective Sergeant Maddie Ives and Detective Inspector Harry Blaker. Maddie is transferred from another force area and assigned missing persons cases. At the same time DI Blaker is called to the scene of a hit and run, which he is convinced is deliberate. Two separate cases but it isn’t long before links between Ives’ and Blaker’s cases are established and the two police officers have to work together. I have to be honest and say that it took me a little while to warm to Ives’ because she (sorry to be blunt) seems to be so far up her rear end that she has almost disappeared. She has self confidence in abundance, she has ideas above her station and her expectations exceed her capabilities (but that’s just my opinion). She is also very opinionated and doesn’t hesitate to let everybody know her views. It was a lot easier to take to DI Blaker, who is basically a grumpy old git and he works a lot of hours. At first I wasn’t sure that Ives and Blaker would get on because they have such different personalities but somehow they get on well together and they are one strong team. Holy moly, ‘He Is Watching You’ is one hell of a fantastic start to what promises to be a fantastic series. I was hooked from the moment I started to read. Charlie is a serving police officer himself and so you know that his writing is going to be authentic, gritty and raw. He doesn’t hold anything back or sanitise anything. Reading ‘He Is Watching You’ soon became an addiction and I turned into an addict, who was always in need of her next fix. I found it nigh on impossible to put the book down and the book went everywhere with me because I couldn’t stop reading. I tried to ration how much I read in one session because I didn’t want to finish the book too quickly. That idea soon went out of the window. I binge read the book over the space of a couple of days which really worked because it gave me some idea of the intensity of the police investigation. Charlie writes so convincingly and so realistically that I really did feel as though I was a member of the investigating team. I started to interact with the book and by that I mean that I was giving out tips on what to ask or focus on and I would say rude words occasionally because of something I had read. Get me, I am an addict of all things Law & Order- all versions, NCIS Los Angeles and I think I am an expert on the legal system. Ha ha. ‘He Is Watching You’ is superbly written. Charlie entices you in to the story and before you know it you just can’t escape his clutches. The story is written from three different perspectives- that of Harry, that of Maddie and that of the killer himself. This way of telling the story works really well, the chapters interlink and the story flows seamlessly as a result. Some of the details might be a bit gruesome but not enough to put me off reading it. For me, ‘He Is Watching You’ has the perfect mix of drama, suspense, murder, mystery, intrigue and gritty realism. I absolutely loved reading it and I can’t wait to read the next in the series. Here’s hoping that we don’t have too long to wait- hint hint. I would definitely recommend this author and all of his books to other readers. The score on the Ginger Book Geek board is a very well deserved 5* out of 5*.